Handmade in Belgium for The National Shoe Store, London, Wardour St. Printed on the silk facing. Bought in 1925 by Lionel Ernest Bussey. A note at the time of their donation (by the executors of his estate in 1970) records that out of all the shoes and boots in his collection, these were Bussey's most favourite. "Lionel Ernest Bussey collected shoes from about 1914 until his death in 1969. The shoes, all ladies, were bought from ordinary fairly good class shoe shops, like Dolcis and Lilley & Skinner, and represent almost all types of fashionable shoe throughout the period, even during the periods of scarcity between the two great wars. Mr Bussey seems to have liked ladies shoes in general, and not just one particular type. His taste seems good and not eccentric.By his death he had collected about 600 pairs, all new and unworn, many not even unwrapped, still boxed up with their (dated) bills. He was fairly well off and spent a considerable amount on his collection. He had an eye for quality. He took his collection seriously and in his will left them to a museum. I was contacted by his executors, the Midland Bank. I had to select quickly because the house was under offer, no doors would lock, and surveyors were wandering around. In the end I brought about 80 pairs back to the museum. Disposal to other collections There were obvious repetitions of style and since I knew we would not want such a quantity I arranged for Northampton to collect the major part, after I had made my selection, direct by van. I suggested that they sent duplicate material to Miss Buck and Mrs Moore. We could offer our spares to the same collections. Mr Riley collected 37 pairs for Brooklyn (exchange I hope for the offer of a good Chanel suit). I checked with the Midland Bank that passing to non English museums was permitted. Mr Bussey also collected papers: our library obtained back numbers of The Sketch, the London Library some books and the British Film Institute many old Film Journals. Our Own Shoe Collection we get many enquiries from designers and students. We show our best examples in the Costume Court, but though we have several fine pairs our collection is very unrepresentative. We probably have more 18th century shoes than 19th, and almost no 20th century material except for Heather Firbanks' shoes, all 1910-20. We are rarely offered shoes, and if so usually evening shoes or black button boots. Old worn shoes are rarely aesthetic, in any case! My Selection I chose about 85 pairs to go through in detail at the museum. Please could we consider acceptance of about 50 pairs of cover the period 1914-1965, about 10 a decade. I cannot, I think, that unless (heaven forbid) there are more collectors like Mr Bussey such an opportunity will occur again. Nobody but an eccentric, after all, would systematically collect wearable shoes, and then not wear them! His collection is all the richer because he was not restricted to what fitted and suited him. 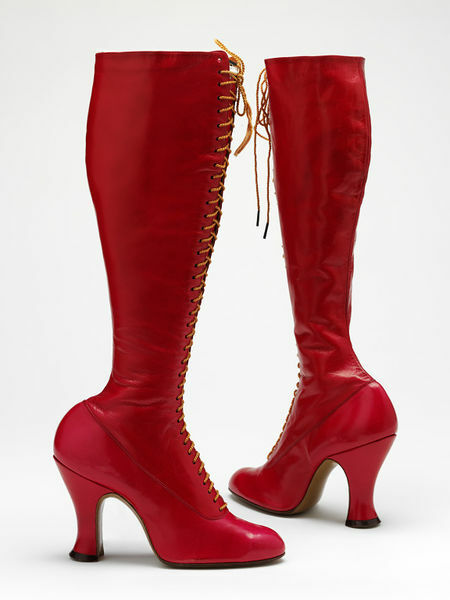 The basis for my selection has been the quality and design of each individual pair of shoes or boots, and representation of the main style changes not as far existing in our collection." Lionel collected shoes from about 1914 until his death in 1969. 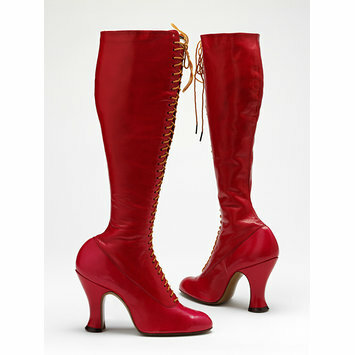 He bequeathed part of his collection to the V&A. The shoes, all for women, were collected from ordinary but good quality shoe shops. They represent almost all types of fashionable shoe from the period. The collection even represents the scarcity of shoes in the inter-war years. By the end of his life, Lionel had collected about six hundred pairs of shoes, all new and unworn. Many were not even unwrapped and were still boxed up with their receipts. All of the shoes in this case were bequeathed by Lionel Ernest Bussey.